Beloved husband of Diane nee Tillman. Loving father of Valerie Rae (Mark) Pulchinski. Proud grandfather of Alexis Rae Pulchinski, Victoria Rose Pulchinski, and the late Luke Carrington Pulchinski. Dear brother of Genieve (Roberto) Arzate, the late Spencer W. Line, and the late Jean Ellen Schultz. Retired after 35 years as a Stationary Engineer for Jewel Foods. Lloyd enjoyed fishing trips with friends and family, loved to travel and was a very humble and kind person being able to help his family and friends. 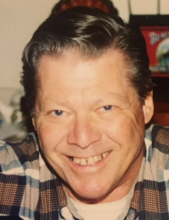 Visitation Sunday, Jan. 13, 2019, 3:00 pm to 9:00 pm at Sax-Tiedemann Funeral Home, 9568 Belmont Ave., Franklin Park. Family and friends will gather at the funeral home for the funeral service on Monday, Jan. 14, 2019, 11:00 am. For information please call (847) 678-1950 or www.sax-tiedemann.com. "Email Address" would like to share the life celebration of Lloyd Dean Line. Click on the "link" to go to share a favorite memory or leave a condolence message for the family.